UK, 2011, 97 minutes, Colour. Voices of: James Mc Avoy, Hugh Laurie, Jim Broadbent, Imelda Staunton, Ashley Jensen, Marc Wootton, Laura Linney, Eva Longoria, Michael Palin, Sanjeev Bhaskar, Robbie Coltrane, Joan Cusack. We remember the Aardman Studios for their wonderful animation short films, especially those with Wallace and Gromit. More recently they have made feature films, Chicken Run and The Curse of the Were- Rabbit. This time, they have been shrewder in picking their target audience, children, younger children who delight in Santa stories whether they believe in him or not. 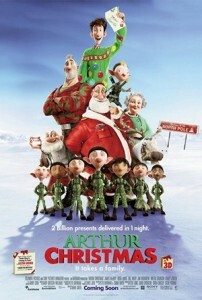 And the parents and grandparents who take the children along will enjoy Arthur Christmas as well. And it was filmed in 3D. So, who is Arthur Christmas? He is the younger son of the current Santa Claus. As with the Australian-French? co-production, Santa’s Apprentice (which has many similarities with this film), Santa’s job is only a temporary position (say, 70 years or so). However, the North Pole has been transformed into an extraordinarily well-equipped computer technology production (and wrapping) line (remember Elf and Fred Claus). It is all under the control of Santa’s older son, the imposing body-builder look-alike, Stephen. The film reminds us that the presents have to be delivered worldwide in a short space of time. The computer programming, with the help of a space-ship ultra-speed sleigh and a bevy of elves who deliver parcels, makes this a beyond-Pentagon success story. But, the little girl who writes a letter to Santa at the opening of the film, through an unobserved glitch, does not receive her present. Potential disaster. Stephen doesn’t worry. The statistic doesn’t affect his success rate – and it is only one child. Santa is complacent and goes to bed. It is only the geeky Arthur (certainly no body-builder) who causes mayhem wherever he clumsily goes, who sets out to deliver the parcel, with the help of the grumpy and selfish Gransanta and some very old reindeers and a sleigh called Eve. Needless to say, they get lost and have all kinds of adventures, even being chased by lions in Africa straight out of The Lion King. Plenty of activity to keep the young attentive. And an excellent voice cast to amuse everyone. James McAvoy? (who is a little weedy-looking in real life) gets us on side for Arthur. Jim Broadbent yo-ho-hos to great effect as Santa (with Imelda Staunton as his practical wife, Margaret). Lots of fun is had with Stephen (and at his expense and comeuppance) since he is voiced characteristically by Hugh Laurie. Old Gransanta is Bill Nighy. So, it’s a Santa story for the IT 21st century. 1. An entertaining Christmas story? For the whole family? 2. The British background, Aardman Studios? Characters, style of drawing, design, voices? 3D? 3. The target audience, children, those who believe in Santa Claus, adults? 4. The opening with Gwen’s letter, children’s belief in Santa Claus, the gifts? 5. Arthur, answering the letters, nice, in his department, awkward, his gaffes, mishaps, entering the main room and his pratfalls, disturbing everyone? Comedy? Ousted – people running him down or taking pity on him? 6. The contrast with Stephen, the older brother, the Superman look, his skill in IT, commands, the elves and their work, the S1 spaceship, its size, delivering all the presents, the proper timing on Christmas morning, the information for the technology? Stephen and his character, military style? Not a people person? 7. Santa, getting old, seventy trips, supervising the work of the elves, his entry into the homes? Deliveries, getting home? The touch of the pomposity? The toast to success? His wanting to continue rather than hand over? His love for Margaret, their domestic life? 8. The deliveries, starting in Denmark, the coordination, the gifts, the sleeping children – and not wanting them to be awake? The alarm with the child awake, the difficulty with the toys, the batteries? Success? Getting around the world in the short time? 9. The accident, the bike falling, being swept up, being found, the crisis with one gift not delivered? 10. Stephen, the handling of the crisis, his refusing to go, thinking it was only one child? Hardhearted? 11. Santa, going to bed, pomposity, his wife urging him up? 12. Grandsanta? His age, his career as Santa Claus, pre-information technology, the sleigh, the reindeer, his memories, of the war, the Cuban missile crisis, the sleigh called Eve? His vanity? 13. Arthur, his concern, trying to find any way to deliver the present to Gwen? 14. Bryony, elf, her skill in wrapping, her supporting Arthur? Going on the trip? 15. Arthur and his grandfather, persuading him to take Eve, the reindeer? His landing in Idaho – and the American thinking it was UFO, reporting them? The reindeer on his service station, making up for the reindeer that was lost? Going to Toronto, to Mexico, to the wrong house? Going to Africa, the pursuit by the lions? The crash? Cuba? Arthur’s attitude, his grandfather’s attitude? The fire, taking the boat, rowing? Arthur and his worry, the capture, going to the United Kingdom? 16. The elves, the meltdown? Crisis in the works, wanting to give up, their scurrying about? Saved at the last moment? 17. Santa, waking, his discussions with Stephen, with Margaret? His being shamed into supporting Arthur? 18. Stephen, his change of heart, mistakenly going to Mexico, everybody arriving in Cornwall? 19. The success of the mission? Arthur, cycling, in the town, Gwen and her waking, keeping her asleep? The gift? The elves cheering with the success? 20. Gwen, her parents, the delight in the gift? Santa, Grandsanta and everybody happy? 21. Arthur being acclaimed as the true Santa? 22. The happy ever after? The continuity of Santa Claus and his gifts? The streamlining of the deliveries? A Christmas entertainment for a 21st century audience, and technologically-trained children?